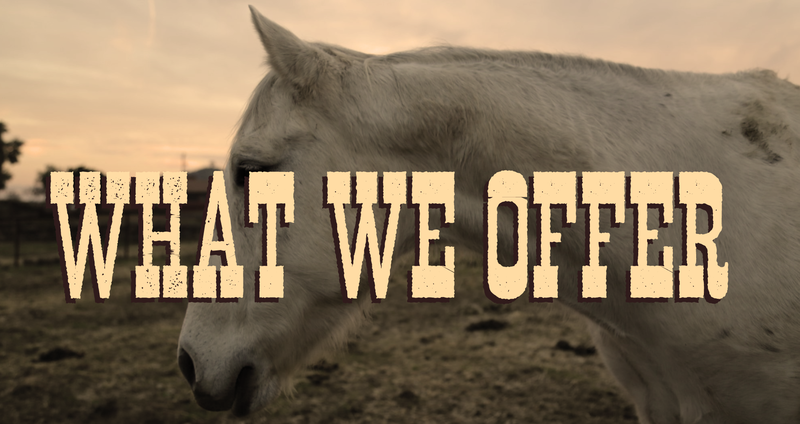 What is Crown Valley Youth Ranch and what do we offer? Our Horticulture program is perfect for the kids that love to garden. We use the square foot gardening technique, which allows kids to have their own garden box to take care of. They will learn how to garden and harvest a variety of flowers and crops. Learn more here. In Arts & Crafts, there are so many different activities your child can do. We offer painting, drawing, crafting of any kind, woodworking, and much more. Anything you can craft, we offer. Learn more here. What does a Session Leader do? Each Session Leader is paired with a Session Intern. They work as a team with each student. Together they design and create a plan towards achieving certain goals that have been established by the student and parents, with regard to what the ranch offers. During their time with each student, they teach, encourage, give hope and empower each student from based on the child’s understanding. This is achieved by “LISTENING”. We offer so much fun here at the ranch but this is only for the reason of creating an environment that earns trust. After this we can begin. In advance the Session Leading Team will put together a “Session Plan” based on the information first received by the parent interview and interest form. The first session will be an orientation which helps us become more familiar with the student and it allows the Session Leader to hang out and show you all of the possibilities the ranch has to offer. Our staff always looks forward to this day! After orientation, a customized plan will be developed by the Session Leader. They will use the interest request form, parent interview, and the orientation session as a starting point in the student’s plan development. After a plan has been made, it will be shared with the ranch director before finalizing the student’s plan. At the end of each session, each mentor will follow up with an evaluation sheet. This will help understand if what we are doing is working. Also, any further information from the parent would be quite useful. We realize the value of team work, and you are part of this team, teachers, grandparents, youth pastors, counselors, and anyone else around a student can be helpful… so we encourage everyone to help add to these sessions. Feel free to contact your mentors via email or at the ranch. What does my child do during their session at the ranch? Each student is paired with a mentor that best fits them. This will be the students mentor throughout the entire program. We believe that consistency and reliability is important for our kids. We always start in prayer. This is important to us at CVYR. Your child is encouraged, but not forced to pray. This is an area that we believe is personal and must be a desire from the heart and not forced. After the chore time is completed the student can participate in an area that they have chosen to be a part of. The areas that we offer are the following; Horses, Small Animals, Nature (bugs, frogs, snakes, and lizards), Gardening, Crafts, Wood Working/Construction, Sports, Outdoor Survival, and Music (guitar). We ask each student to choose one of these for at least four sessions before choosing another subject. 15 minutes before session has ended both the student and mentor will begin to clean up and close in prayer. Prior to leaving, please check-out with the front office and verify your next scheduled appointment. What is my responsibility as a parent or sponsor? Parent, guardian, or sponsor must provide transportation to and from the ranch. Please be on time. Each student has an opportunity to have a full 90-minute session here at the ranch. When a student arrives late it will take that time away. SESSIONS BEGIN PROMPTLY AT SCHEDULED TIMES. WE ONLY HAVE 90 MINUTES WITH YOUR CHILD AND WE WANT THEM TO HAVE EVERY MINUTE. If you find that you must cancel your child’s session, please inform us as soon as possible. This will allow us to make room for another student who may be on our waiting list. If a cancellation occurs, session cannot be rescheduled but will be continued at the next pre-scheduled date. When you arrive at the ranch, please go to the main office and sign in at the front desk. Make yourselves comfortable. The mentor will be informed that you have arrived. When your student leaves for their session, feel free to relax in our parent lounge or take advantage of the time and run an errand. One little reminder: be back on time to pick them up. During the hours from 1 pm-5 pm Monday- Thursday, the session areas of the ranch are off limits to the public. This is to ensure the safety and privacy of your child. First you must fill out an interest form. To access this form online, click here or click on our “Join Us” page. Once you fill out the Interest Form, please email it to aaron@cvyr.org. Our preferred method is via email, but if you are unable to email us then mailing the form is permissible as well.